Since the Trump administration took office, the Border Patrol has detected fewer gang members crossing irregularly than during the Obama administration. In FY2017, these detections amounted to 0.075 percent of the total number of migrants (228 MS-13 members out of 303,916 total migrants). When combined with MS-13’s rival, the Barrio 18 gang, the number rises only slightly to 0.095 percent. This is far from the “infestation” of violent gang members described by the President. While female Mexican migrants averaged around 13 percent of all Mexican migrants apprehended by the Border Patrol from FY1995 through FY2017, Central American women averaged between 20 and 32 percent. In recent years these numbers have increased even more, with women constituting 48 percent of all Salvadoran migrants in the last fiscal year and Honduran women reaching 43 percent of migrants from their country. A 2017 Doctors Without Borders report noted that 68 percent of the migrants that it provided services to in shelters across Mexico had been the victim of a crime during the journey. Women and children are also at particular risk, with nearly one-third of the women reporting that they were sexually assaulted during their trip through Mexico. 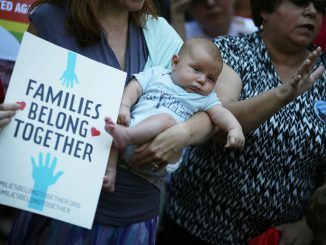 Before the Trump administration’s recent immigration crackdown, these families would be then taken to a family detention centre, where they would have to pass a “credible fear” interview to be released—that is, prove that they have a real fear of returning to their home countries. At least 77 percent of the families pass this hurdle and are released with an ankle monitor or after paying a bond. They can then begin their cases in immigration courts. The Trump administration is looking to shake up this system. From [Trump’s] Inauguration Day to Dec. 31 2017 his administration accepted 29,022 refugees, the lowest number since at least 2002, according to State Department data. Comparable figures before then are not available… That decline will continue in 2018 because Trump instituted an annual cap of 45,000 refugees a year, the lowest cap since Congress created the Refugee Resettlement Program in 1980. Presidents have the authority to unilaterally set the annual refugee cap, which has been as high as 217,000 under President Reagan and hovered between 70,000 and 80,000 under the Bush and Obama administrations. Incredibly… during the first quarter of 2018, the US accepted only 11 refugees from Syria. Footnote: This complete lack of compassion from the White House towards refugees is not merely a denial of everything that the Statue of Liberty represents. It also differs from the stance adopted by previous conservative Republican presidents, including Ronald Reagan. As a politician from a California heavily dependent on migrant farm labour, Reagan was able to recognise the positive contribution that migrant labour makes to the US economy. Check out for instance, these fascinating speech notes from a radio address that Reagan gave back in 1977. Talkback radio being what it is, it hasn’t been surprising to find some on the lunatic fringe complaining that the prime ministerial baby is being hawked around for political gain. The reverse has been the case. At recent post-Cabinet press conferences – which is supposed to be where the serious political news happens – an awful lot of questions have been directed at Jacinda Ardern about baby-related issues, such as the baby’s name and related personal matters. By and large, these were met with a polite, but gritted teeth response on her part. Safe to say, such questions were not encouraged. More justifiably, there were also a lot of gallery questions about the transitional arrangements during maternal leave. Less justifiably last week though, the gallery asked the visiting European Union’s Trade Minister Cecelia Malmstrom – at the launch of the negotiations on the EU/NZ trade deal – about what maternal advice she might have to offer to the PM. Point being, only the minimum of the baby coverage has been initiated by Jacinda Ardern and her partner, and that mainly to feed the salivating media pack a few morsels to keep it at bay. The bulk of the coverage has been entirely media-driven, in imitation of British tabloid frenzies about celebrity births. This approach seems like an alien import to a New Zealand that’s usually more inclined to give new parents privacy, and sufficient room to adjust to the demands of a new baby. Winston Peters got the tone exactly right when he said the birth was a happy event, but not a historic one. Big deal for the people involved, no big deal for anyone else. Can’t stop haters from hating, though. Yet… hopefully, today’s ghastly readiness by Simon Bridges (when urged on by Jeremy Wells) to make ‘joking’ references about pinko ideology and gender fluidity at the expense of a two day old baby, will be the absolute rock bottom of this commentary. You’re left to die of exposure, Sarah….